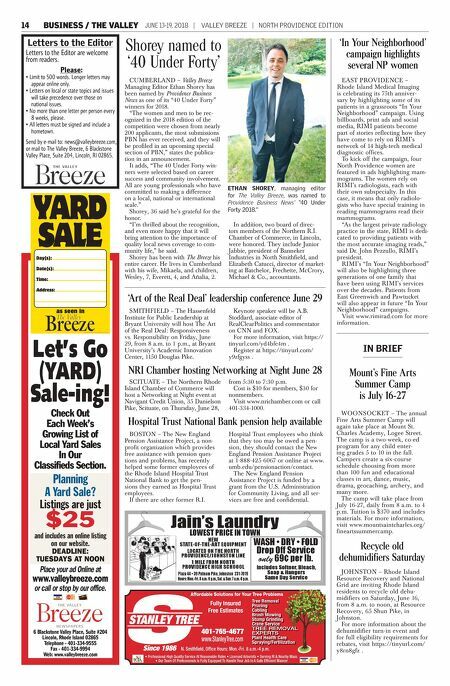 NORTH PROVIDENCE EDITION | VALLEY BREEZE | JUNE 13-19, 2018 THE VALLEY 15 PROVIDENCE – A bill to place an extra tax on sugary drinks in Rhode Island got the dreaded "held for further study" treatment last Thursday, and its sponsor, Sen. Donna Nesselbush, is conceding this week that it probably needs more work. Nesselbush, of District 15, serv- ing parts of Pawtucket and North Providence, said the soda industry was obviously against her bill, but she maintains that the "correlation between sugar and disease appears strong." The bill developed by the American Heart Association had drawn support from some advocacy groups but strong opposition from others, including the Libertarian Party of Rhode Island. Under the bill sponsored by Nesselbush, sodas would have had a 2-cent tax tacked on per fluid ounce, or 24 cents for a 12-ounce can. Estimates were that the bill could generate an extra $27 million in tax revenue, to be funneled not into the General Fund but into the new Children's Health Promotion Fund. Nesselbush said the language in the bill regarding obesity seemed problematic as it appeared to com- bine sugar and obesity as the cause of disease when one witness pointed out that sugar is dangerous and causes disease even for people with small or medium-sized bod- ies. Taxing as a way to drive people away from a behav- ior "is tricky," Nesselbush told The Breeze. Though the American Heart Association is sol- idly behind the bill, she does think it needs more work. There's no need for opponents to worry about the bill passing this year after the Senate Finance Committee held it for further study, she said. Nesselbush had promoted the "small tax on sugary drinks" as an way "to decrease sugar consumption and increase health," according to a release. Greg Glassman, founder of CrossFit, was among those to testify on the bill. Nesselbush and her wife, Kelly Carse, own affiliate Industrial Revolution CrossFit on Smithfield Avenue in Pawtucket. Glassman testified against the efforts by the soda industry to influ- ence health science and policy throughout the country. Joining Glassman as Nesselbush's guest was Nick Wishart, a member of Industrial Revolution CrossFit who in January completed the World Marathon Challenge, successfully running seven marathons in seven days on seven different continents. No other states currently have a bill similar to the one from Nesselbush. State lawmakers attempted to pass a similar measure back in 2013. Sen. Nesselbush concedes that 'sugary drink' bill needs work By ETHAN SHOREY Valley Breeze Managing Editor ethan@valleybreeze.com NESSELBUSH Mancini Center announces activities NORTH PROVIDENCE – The Salvatore Mancini Resource and Activity Center announces the follow- ing programs. Dine & Dance: Wednesday, June 20. Lunch will be served at noon and entertainment will be provided by Steve Burke from 12:30 to 1:30 p.m. A performance of the play "Love Letters" will be held on Wednesday, June 27. Light refresh- ments will be served at 1:30 p.m.; showtime is 2 p.m. Admission is free for Mancini Center members and $2 for non-members. Tickets are avail- able at reception desk. The North Providence Police Department will be holding a "Roll Call" at SMRAC on Wednesday, June 20, at 11 a.m. This type of forum will provide a briefing on department operations and services. A Mah Jongg Tournament with Mancini Senior Center vs. Lincoln Senior Center will be held on Thursday, June 14, at 9:30 a.m. A craft class is offered every Thursday morning from 10-11 a.m. Each class offers a new project. Visit the front desk for a peek of the first craft. Supplies will be provided for the June 14 class. All participants are required to sign at reception desk or call 401-231-0742. For more information, call 401-231- 0742. 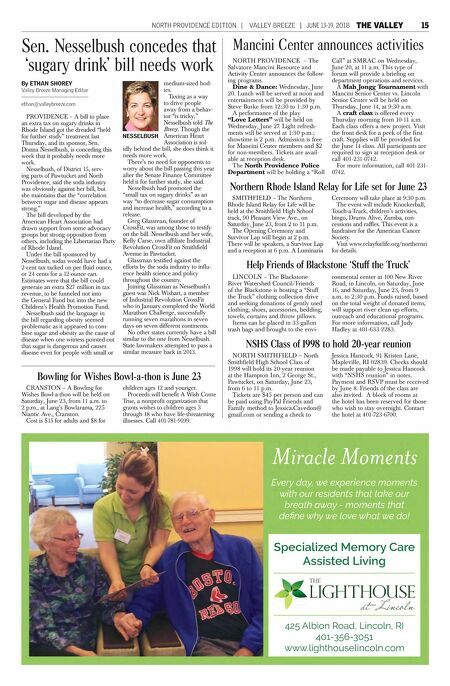 Northern Rhode Island Relay for Life set for June 23 SMITHFIELD – The Northern Rhode Island Relay for Life will be held at the Smithfield High School track, 90 Pleasant View Ave., on Saturday, June 23, from 2 to 11 p.m. The Opening Ceremony and Survivor Lap will begin at 2 p.m. There will be speakers, a Survivor Lap and a reception at 6 p.m. A Luminaria Ceremony will take place at 9:30 p.m. The event will include Knockerball, Touch-a-Truck, children's activities, bingo, Drums Alive, Zumba, con- cessions and raffles. This event is a fundraiser for the American Cancer Society. Visit www.relayforlife.org/northernri for details. NSHS Class of 1998 to hold 20-year reunion NORTH SMITHFIELD – North Smithfield High School Class of 1998 will hold its 20-year reunion at the Hampton Inn, 2 George St., Pawtucket, on Saturday, June 23, from 6 to 11 p.m. Tickets are $45 per person and can be paid using PayPal Friends and Family method to Jessica.Cavedon@ gmail.com or sending a check to Jessica Hancock, 91 Kristen Lane, Mapleville, RI 02839. Checks should be made payable to Jessica Hancock with "NSHS reunion" in notes. Payment and RSVP must be received by June 8. Friends of the class are also invited. A block of rooms at the hotel has been reserved for those who wish to stay overnight. Contact the hotel at 401-723-6700. Help Friends of Blackstone 'Stuff the Truck' LINCOLN – The Blackstone River Watershed Council/Friends of the Blackstone is hosting a "Stuff the Truck" clothing collection drive and seeking donations of gently used clothing, shoes, accessories, bedding, towels, curtains and throw pillows. Items can be placed in 33-gallon trash bags and brought to the envi- ronmental center at 100 New River Road, in Lincoln, on Saturday, June 16, and Saturday, June 23, from 9 a.m. to 2:30 p.m. Funds raised, based on the total weight of donated items, will support river clean-up efforts, outreach and educational programs. For more information, call Judy Hadley at 401-633-2283. Bowling for Wishes Bowl-a-thon is June 23 CRANSTON – A Bowling for Wishes Bowl-a-thon will be held on Saturday, June 23, from 11 a.m. to 2 p.m., at Lang's Bowlarama, 225 Niantic Ave., Cranston. Cost is $15 for adults and $8 for children ages 12 and younger. Proceeds will benefit A Wish Come True, a nonprofit organization that grants wishes to children ages 3 through 18 who have life-threatening illnesses. Call 401-781-9199.